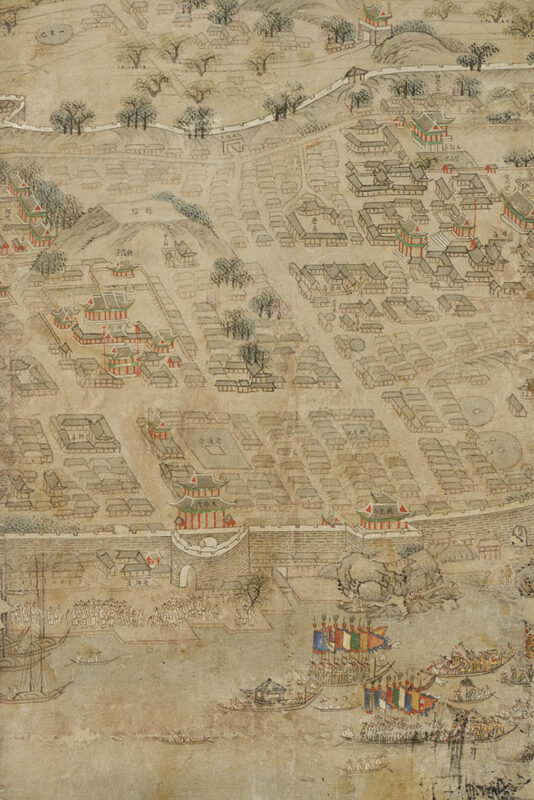 Korea, unknown artist, The Walled City of Pyeongyang (detail), 19th century, ink and color on paper, gift of the Oregon Korea Foundation. This special installation in the Museum’s Korean Gallery is inspired by one of the most important Korean works in our collection: a large folding screen depicting a bird’s-eye view of the city of Pyeongyang. The painting is brimming with information about the city—fabled for its architecture, food, and gisaeng dancing girls—and its inhabitants and environs. The Walled City of Pyeongyang is a topographical portrait of a city, a genre that came into vogue in Korea in the 18th century, with the rise of urban culture and mobility. The Shape of the Land presents new research on the 19th-century Pyeongyang screen and places it in the broader context of Korean mapmaking. Although maps of the countryside and towns were originally commissioned by the government for administrative purposes, by the late Joseon period (1392–1910), hand-painted and printed maps and atlases were widely popular among the general public. Drawing on the collection of Robert and Sandra Mattielli, the exhibition presents fanciful maps of cities, provinces, the Korean peninsula, and the known world. Often highly stylized, these images offer fascinating insights into the values and worldview of Koreans, on the eve of the Hermit Kingdom’s opening to the world. The Museum is deeply grateful to the Oregon Korea Foundation for donating the Pyeongyang screen in 2003 and for supporting the companion brochure for this exhibit. Our thanks also to Sandra and Robert Mattielli for their generous loans. Organized by the Portland Art Museum and curated by Sangah Kim, Cowles Curatorial Fellow in Asian Art.